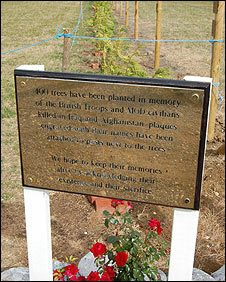 A couple from Rettendon have planted 400 trees to honour the casualties of the Iraq and Afghanistan conflicts. Accompanying each tree are plaques detailing the names of the soldiers and the date they were killed in action. "I think it's a very small price to pay for what these people have sacrificed and I don't mind doing it," said Fran. One row of trees have been dedicated to those soldiers who have been killed in Iraq since 2003, opposite them is another row for those who lost their lives in Afghanistan. Fran and Peter hope that over time these will grow to create a natural avenue for reflection. 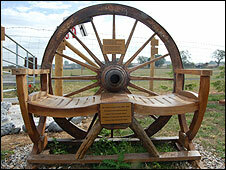 In addition, they have also had plaques inscribed with poetry and benches dedicated to specific servicemen. The initial planting began in February of this year, mainly of leylandii, but they are also in the process of adding a number of indigenous species such as oaks and horse chestnuts. "We are able to do it because of the boot sale - but I don't have any apologies for doing this," said Fran, who herself has served in the armed forces. "By getting people to come out here, I'm able to show them that this is what's happening in another country and these are our men and women." Fran and Peter are keen for it to evolve into a place where the public and particularly the families of the soldiers can spend time and reflect on the losses. "That is something that is very important to me," said Fran. "If they wanted to come over at at any time that would be fine. 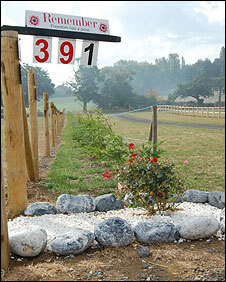 "My main aim is to get it looking so lovely that they will come and they will enjoy it. "This is a work in progress - this isn't something that's going to come to fruition this year or even next year, we're talking about in five or six years time." Fran acknowledges with a heavy heart that they will soon have to start planting more trees as the combined casualty toll passes the 400 mark. Having invested a lot of time into this project, she admitted it can get quite overwhelming. "I do feel quite involved emotionally with them and I do get very upset when I get the information through - and I do get tearful," she said. "I'm not ashamed to admit it and I don't think you can help but [be affected]. "Especially when you have all this information in front of you; you see their ages, some of them are married and some have children."